Get crafty at the Weave Festival and Sma Shot Day celebrations! A programme of interactive design, textile and craft workshops and demonstrations have been announced for this year’s Weave Festival and Sma’ Shot Day celebrations! The annual Sma’ Shot Day celebration, which is one of the world’s oldest worker festivals which celebrates the town’s weavers and mill workers, will take place on Saturday 7 July and will, for the second year running, include the Weave Festival – offering an enhanced and diverse programme of cultural events and activities on the day. Celebrating the town’s weaving heritage visitors will have the chance to head along to a number of weaving demonstrations at the Sma’ Shot Cottages. 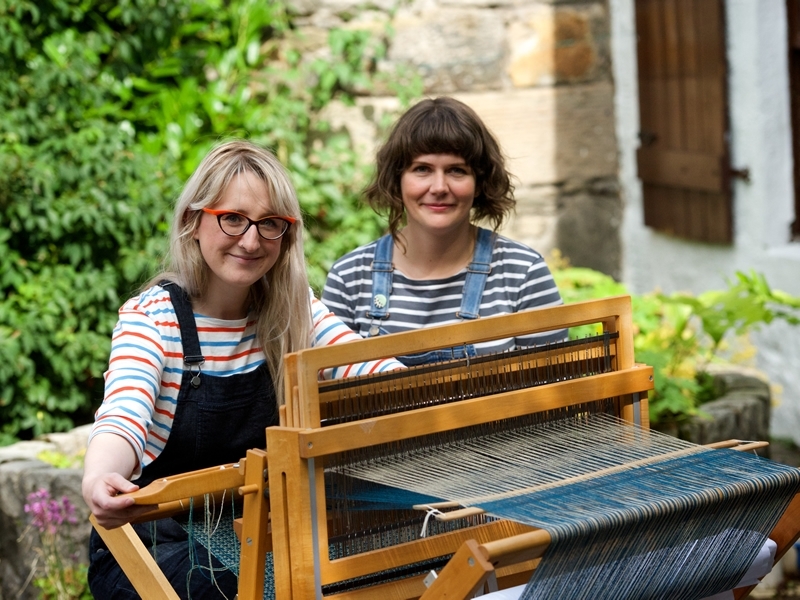 Weavers in Residence, Shielagh Tacey and Heather Shields, who are supported by the Paisley Townscape Heritage and Conservation Area Regeneration Scheme 2 (TH.CARS2), Heritage Lottery Fund and Historic Environment Scotland, will run demonstrations throughout the afternoon. Ever wondered what Sma’ Shot actually means? Shielagh and Heather will tell visitors all about it and demonstrate this famous stitch on various weaving looms and there will even be a chance for participants to have a go themselves. Visual art curator and weaver at Paisley Museum and Art Galleries, Dan Coughlin, will also run a number of weaving demonstrations at the cottages throughout the day. While at Paisley Museum watch award-winning textile designer and weaver Mariam Syed as she weaves beautiful contemporary patterns on a loom in Paisley Museum’s famous loom and shawl gallery. One of the weaver’s in residence, Shielagh Tacey, said: “As part of our weaving residency in Paisley Heather Shields and I have been researching the term "Sma’ Shot". It is such an important part of Paisley’s weaving heritage and yet not many people actually understand what it is or looks like. Carrying on the town’s tradition of making, there will be a series of free design and craft workshops taking place in Paisley Town Hall and Paisley Abbey on the day covering everything from bookbinding and artwork to paper craft. Award winning architect and designers Krisztina and James McCulloch from KCD Designs will work with participants to create unique art work of Paisley’s historic buildings to take home. While JuJu Books will run a woven spine bookbinding workshop using Coats linen and a selection of high quality recycled paper and bookcloth, to allow participants to bind their own A6 book to take away. Iranian textile artist Paria Goodarzi will also host a series of block print workshops where people can learn how to print and use stamp/block printing. Dyed Turkey Red at Weavolution Paisley Hub, where textile researcher Dr Julie Wertz will deliver a hands-on exploration of the history and processes involved in making and using dyed ‘Turkey red’ – a complex dyeing process which produces a bright, fast red colour. In addition to the firm favourites visitors have come to expect from Weave Festival and Sma’ Shot Day such as the workshops, parade and Burning of the Cork, there will also be a new raft of activities to attract and entice the crowds. The town centre will be transformed into a seaside escape in keeping with this year’s theme ‘Doon the Watter’ complete with sandy beach, ice cream and candyfloss.